Careers for Your Cat wins CWA Muse Medallion. Last Saturday at the Cat Writers' Association Awards Banquet, my book, Careers for Your Cat took home a Muse Medallion for the Gift Book category. The nominees were very distinguished and I felt lucky to even be in their company. So I was pretty shocked when the book won. I would like to thank the Cat Writers' Association (CWA) and the CWA judges for the honor. 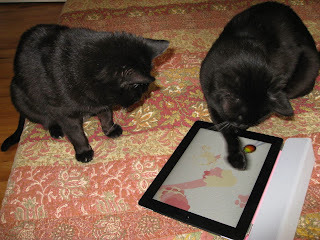 From "Cat Product Testers Review iPad Painting App"
It was quite a night and to add to the specialness, my blog post for paper bag & string "Cat Product Testers Review iPad Painting App" won a Muse Medallion for the Humor category. A big thank you to Ingrid King my CWA mentor for her advice, support and friendship. I would like to dedicate the Gift Book Medallion to Ingrid and to Ann Boyajian, the talented artist who illustrated Careers for Your Cat and gave the book its soul. Ann is the editor of cattywumpus. Hat off to Ingrid, editor of The Conscious Cat, and author of Buckley's Story. She won a special award that night, the Hartz Every Day Chewable Vitamin Award, for "The Joys of Adopting the Older Cat." Congratulations Ingrid! I would also like to give a shout out and thanks to some remarkable people. To Deb Eldredge, who won the CWA Shojai Mentor Award. I would like to add my name to the list of people she mentored. Last year as a newbie to the conference she took me under her wing and made sure I had lunch and dinner companions. She also shared with me some smart advice. That meant the world to me as a new member. To Cindy Read, editor and chief of the Corgi Cryer and Nancy Boyd, an award-winning coach, for their warmth and friendship. It was good to see you both at the conference this year. To Stephanie Harwin, editor of Catsparella and my dear friend and roomie, for her support and adventurous spirit (our specialty is cupcake capers and misplacing our cars.) And to Angie Bailey, editor of Catladyland, for her sweet and unexpected gift. Last but not least I would like to thank Nancy Marano, CWA Contest Chair for organizing the contest, Susan Ewing, CWA President and CWA Vice President, Dusty Rainbolt. Click here for the list of CWA Muse Medallion winners and for the CWA Special Communication Contest Awards. Congratulations on your award! What fun to be with so many cat lovers all in one "real" place, in real time. Such good news! Congrats!! I can't wait to get my hands on your award winning book! A few of my cats are interested in pursuing careers, so this should be just the thing to get them on track! Congrats fur sure, we are so proud of you! YAYAYAYAYAYAYAYAYAY!! HUGE CONGRATULATIONS!! Well done you!!! You should proudly add "award winner" to the tag of your book cos it is!! Yay for you!!!! Wowie! Mes so excited that they realized that yous is as excellent as we knows yous is! Concatulations! Me is soo happy. Hooray to you from Skootch and Lucy - and thanks for the shout-out! Congrats! I'm so sorry I missed out! Wow, congratulations Ann! That is fantastic!